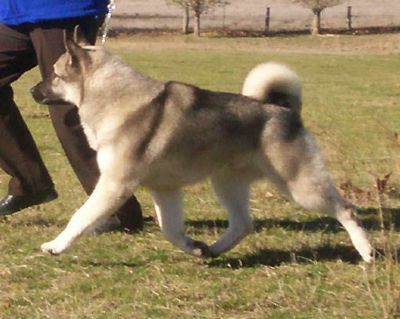 "Demonstrates agility and endurance; stride at the trot even and effortless, back remaining level; as speed of trot increased, front and rear legs converge equally in straight lines toward a centre line beneath body." 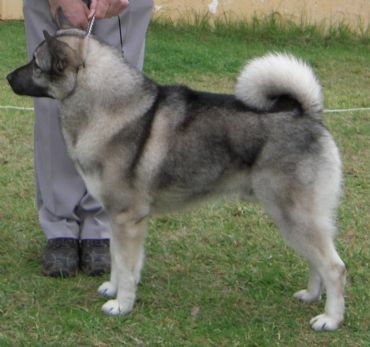 "The Norwegian Elkhound is used for hours of hunting in forests, not for speed on open plains. The gait is natural and varies with speed and terrain; it should not be flashy or exaggerated, nor with excessively long forward reach. 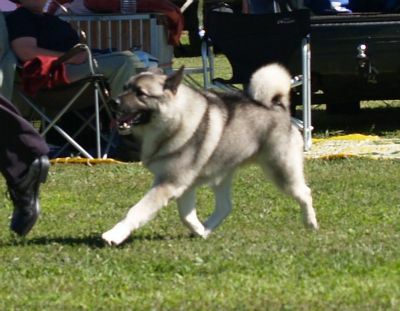 The correct gait is versatile and efficient without wasted motion; it will look effortless and call little attention to the dog"
STILL the only Elkhound to be awarded a BEST IN GROUP by Garby Markotany, then onto Runner Up BEST IN SHOW under Megan Markotany.